But Deliver Us From Evil is a horror written and directed by Joshua Coates, which bases itself on lore from the Bible. While it is a film about a demon it eschews the typical possession plotline and instead plays out kind of like Species, but replacing the alien with a succubus who only seeks out males and who kills them during intimate moments. Jeremiah (Grant Harvey - Supernatural) is a loner who has spent his life in foster care, he was unable to get adopted due to the strange condition he has that grants him visions of the future for people in peril. The movie starts with him arriving at college to study religion, but unknown to him it is also the place that an ancient demon known as Lilith (Alice Rose) has chosen to carry on her endless mission to corrupt men and kill them. While this has some interesting ideas behind it I felt that the budget couldn't really give the room needed to explore these themes. Jeremiah is not a likeable lead which from the start makes it hard to get too invested in his story. He is an unlikely protagonist in that he comes across as abrasive and weird, but he also doesn't work as his story seems to be almost turned into a subplot with him only joining the main plot of Lilith's rampage very near the end. In fact the realisation for him comes with just ten minutes of film time left. Leading up to this point he indirectly helps and hinders people as he wanders around campus acting all brooding and preoccupied with the visions he has. A twist occurs that seems to reveal to him just who the strange woman who has befriended him actually is (Lilith of course), yet the very next scene he is with the lady and apparently didn't get the memo as acts like he has no idea she is a force of evil. This leads up to a farcical exchange with another character that I couldn't tell if it was meant to be funny or not. Side characters appear and then disappear as and when needed. Jeremiah's room mate; Pete (Pooch Hall) for instance starts the movie as a bit of a nasty character, there is an arc of him warming up to Jeremiah and starting to believe he has powers, only for this character to be removed from the rest of the movie, no resolution whatsoever for his arc. This again happens with a friend Jeremiah makes on campus; Sonja, they share many scenes together and it feels like their story together is going somewhere, then bang; something happens and she vanishes from the movie never to return. I don't know if it was bad writing or if there wasn't the time or budget to satisfactorily wrap up these characters storylines but each time this happens it felt plain weird. There are quite a few different side characters and to my memory none of them get fully fleshed out, they are used for the relevant scenes then are put away once their purpose is served. With an off putting lead there was no real character I could get invested in aside from bizarrely Lilith. As the antagonist Alice Rose was great, at least visually. She looks stunning and so this works for a demon who is meant to be able to seduce any man. Whenever she speaks though she seemed so transparent and insincere that I wondered how anyone could fall for her lies. In a way though this works for her character, her looks alone are enough to intoxicate anyone, making them really stupid and so not paying attention to how she is talking to them. This could be seen as a critique on males in general putting too much stock in physical beauty rather than what lies under the skin. There were some actually pretty nice effects used for her, though sometimes the CGI bordered on comedic. She gets fangs, and her eyes change to resemble those of snakes, while the rest of her transformation is kept hidden until the finale when you get to see her in her slightly dodgy looking CGI form, but regardless of the quality it was an interesting monster design. The make-up effects for the many victims were pretty fun, there is are face trauma effects that looked effective, and one great part where a character has part of their face ripped off and you can see their teeth through a hole in their cheek! So the story for what happens in the film is pretty silly stuff and seems confused in how it wants to handle it. You have a detective hunting Lilith who thinks he is after a serial killer, his story goes nowhere. You have Jeremiah not really doing much at all, his friends that don't do much either, and a beginning that feels mostly unrelated to the rest of the movie. What But Deliver does do well is exploring the origins of the demon, this is both shown via literal flashback scenes, a charming introduction picture board sequence, and a professor in a religious studies lecture who coincidentally is doing a study into the origins of Lilith. Somewhere within this film there is a good idea trying to get out, however the way this has been arranged, and the decisions made with reference to characters and what they do just ends up giving something that feels a bit off and unfocused. 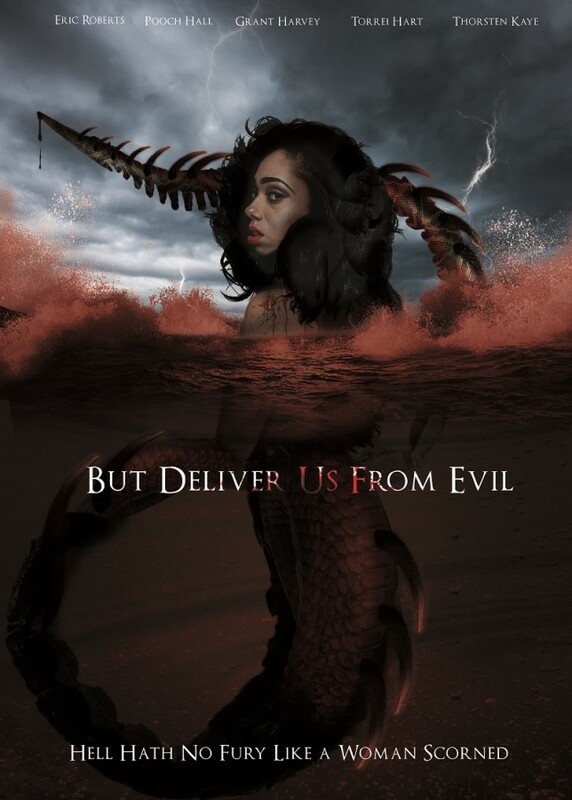 But Deliver Us From Evil was released on March 20th thanks to Indican Pictures.